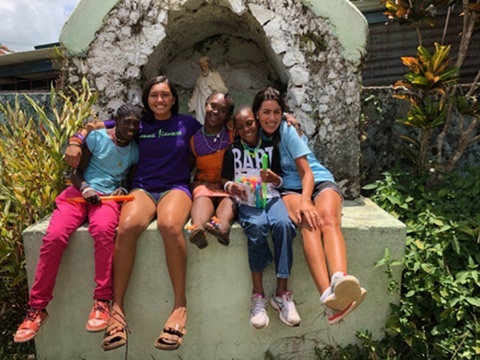 Check out what our Youth Mission Team did in Jamaica last summer! Join us for dinner on Monday, April 29 at the Killarney House (584 W. Central Avenue, Davidsonville, MD 21035). A selected menu will be available beginning at 5pm that evening. Menu price is $25 per person plus tax & gratuity. $10 from each menu will be donated to our Youth Mission to Jamaica in July. See the flyer for menu options. Reservations are requested if you plan to attend. Call Killarney House at 410-798-8700. Questions? Contact Father Josh at joshua.laws@archbalt.org. Mustard Seed Communities (MSC) is an international Catholic nonprofit dedicated to caring for the most vulnerable populations throughout the developing world. MSC began in 1978 as a home for a handful of children with disabilities who had been abandoned to the streets of Jamaica. Today, MSC provides loving and lifelong care to over 600 children and adults with disabilities, children affected by HIV/AIDS, and young mothers in crisis across Jamaica, Nicaragua, Dominican Republic, Zimbabwe, and Malawi. Our mission week will be spent at an MSC community called Jacob’s Ladder, located just outside Moneague, Jamaica. Jacob’s Ladder provides shelter, health care, and community to 95 adult residents with varying degrees of developmental disabilities. While at Jacob’s Ladder, we will participate in small work projects, have time for group prayer, reflection, and sharing, and most of all we will spend time getting to know the residents. To learn more about the mission and Mustard Seed Communities, visit https://www.mustardseed.com/. To DONATE to the Mustard Seed Mission, visit Online Giving, and after you log in, select “Jamaica Mission” in the drop down. We greatly appreciate your donations, support, and prayers for our past fundraising opportunities this year! Copyright © 2018, Our Lady of the Fields. All Rights Reserved.